'Spam a la Greque' served at the White Tower restaurant, 1 Percy Street, W1. 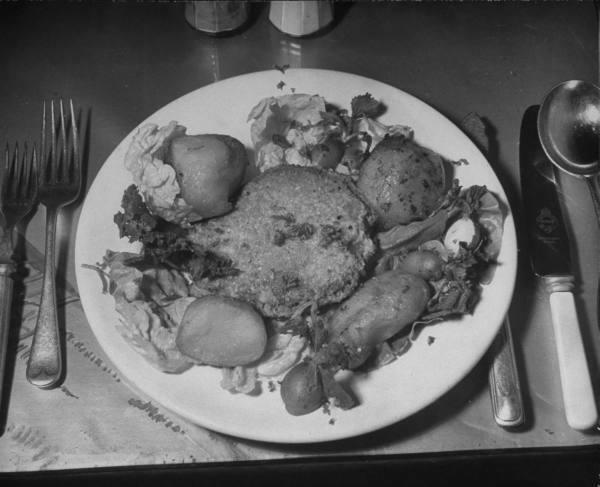 Everybody knows there was extensive food rationing during the second world war, in London, as well as the rest of the country. However meals eaten away from home, whether in expensive West End restaurants or industrial canteens, were what was called, ‘off ration’. 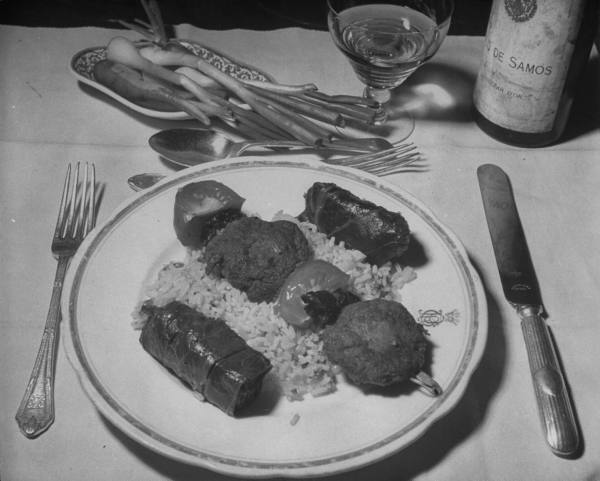 Rationing hadn’t lasted that long before it was soon noticed by many people, especially those working and living in the West End, that the rich seemed to be able to enjoy close to pre-war levels of gastronomy at the best restaurants and hotels. Chaufroid de Volaille Yorkaise served at Piccadilly's Regent Palace Hotel. The chef hasn't gathered yet that it won't matter how much poking around he does, he won't make it look edible. Spam served at Francati's. Mmm. Vol au Vents of spam and white sauce with lettuce. Yum. 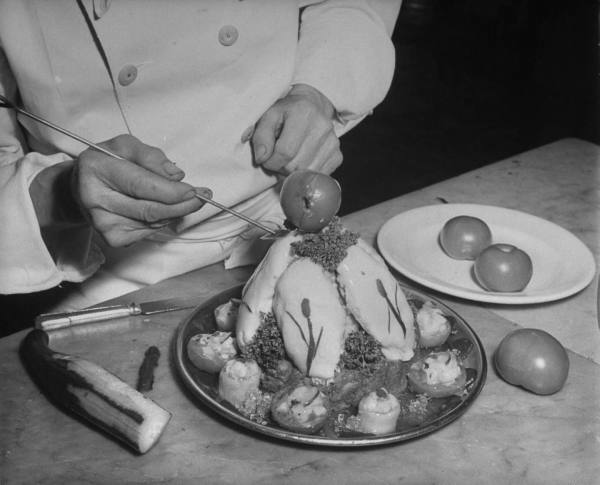 Many people bitterly resented the ostentatious gorging on expensive meals. There was a definite sense of, what was described by the Ministry of Agriculture and Food at the time as, ‘an inequality of sacrifice’. 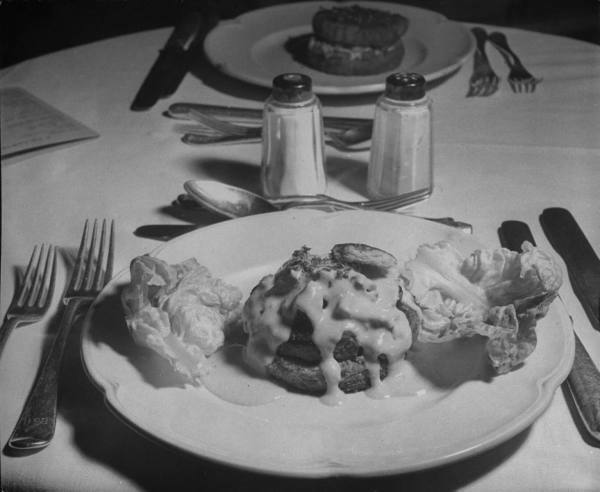 In 1942 the Government acted by creating a flat maximum charge that prevented restaurants providing meals to customers that cost more than five shillings (25p). Although it was pretty easy for a few of the more salubrious restaurants to charge extras over and above this sum (say for the orchestra or the dancing and the like) generally though, the aim of the new law worked, and it pretty well made the morale-dissipating effect to disappear. That said, it didn’t really matter how luxurious and expensive your establishment was, decent meat, along side many other ingredients, was often very hard to source. 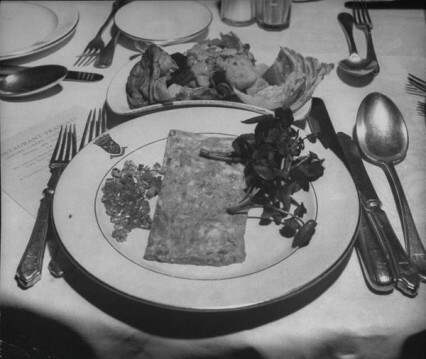 So throughout the war the ubiquitous Spam increasingly found itself on restaurant menus. The cheap reconstituted pork product was invented in 1937 in America, and the name is either an abbreviation of Spiced Ham or short for Shoulder of Pork and Ham. No one seems to know. The fascinating photos above were taken by Ralph Morse for Life magazine and published January 1944. Planked Spam, double yum. A more typical British use of Spam during WW2 and beyond would have been Spam Fritters. 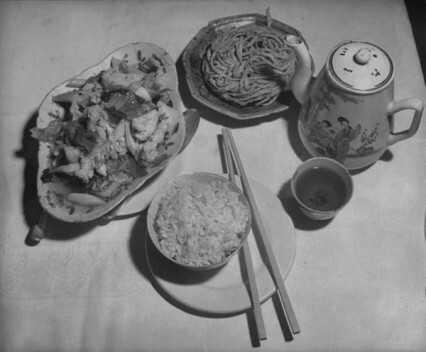 These were often served in Fish and Chip shops as fish became more scarce. This entry was posted on Sunday, June 21st, 2009 at 3:35 pm	and is filed under London, West End. You can follow any responses to this entry through the RSS 2.0 feed. You can leave a response, or trackback from your own site. We always had spam in the cupboard when I was a kid (in the 70s). I always remember sandwiches when people came to visit, or when we visited, being made with spam and pickle. I can remember cooking Spam Fritters when I was in the scouts in the seventies too. Couldn’t quite believe it still exists. I obviously don’t go down that particular aisle in Sainsburys. Fish paste probably exists down there too, along side the Fray Bentos tinned steak and kidney pudding. sometimes being vegetarian sounds soooo good. Yes, they are all still there – and Fray Bentos tinned pies are among the select few imports in the British section of my parents’ local French supermarket! 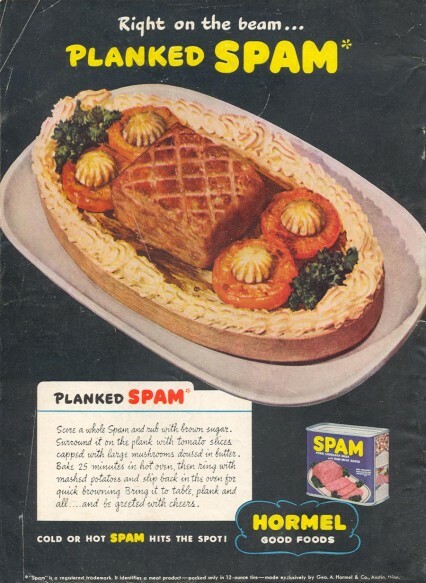 Loved Spam when I was a kid during the War, when we could get it, still love Spam today. I even use it as fishing bait when I go Carp fishing. Spam fritters speak to me of 70s school dinners, I’d go for one now. On a trip to South America I was amazed to discover that Fray Bentos is actually a meat-packing town in Uruguay, named after a priest (Friar Benedict)! Is the picture with caption “Chaufroid de Volaille Yorkaise served at Piccadilly’s Regent Palace Hotel” the real thing if so where did you come by it any story attched to it?? Ugh, Spam. It is in fact short for “Spiced Ham” – years ago, before the ubiquity of Teh Interwebs, she would fax me historical info on that and other Hormel products. She took their products very, very seriously. Hormel has a rather charming Spam timeline at http://www.spam.com/about/history/default.aspx; for trivia (and propaganda), see http://www.spam.com/games/facts/default.aspx. I can’t stand the stuff, but I love that an American product was mocked by Monty Python and as a result came back to the U.S. as a term for unwanted emails. Nice cultural exchange there. My dad worked at the White Tower after the war! Thanks for this. This certainly made me think of the Monty Python Spam sketch. Oh, and Hawaiians really love them some spam! The White Tower was owned by my Uncle (John Stais). I am looking for any stories about the restaurant and the people that worked there . For My biography that I am writing. Could Theodoros please contact me. It would be much appreciated.